Photo taken by police when Dominic Oyerinde was arrested Tuesday, suspected of hospitalizing his girlfriend, Anna List, by hitting her on the head with a blunt object. He was charged with four felony counts and issued a $2 million bond today. Jan. 15, 2009 · 2:25 p.m.
Dominic Oyerinde was charged with four felony counts and issued a $2 million cash bond at his arraignment this afternoon. Without a lawyer representing him at the Washtenaw County Jail, Oyerinde stood mute to charges of assault with intent to commit murder, assault to commit great bodily harm, assault with a dangerous weapon and larceny of a vehicle. Magistrate Camille T. Horne entered a plea of not guilty on his behalf. Oyerinde could face up to life in prison if convicted. 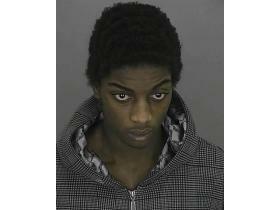 Oyerinde, 20, is accused of bludgeoning his girlfriend, 17-year-old Ann Arbor resident Anna List, with a blunt object. Police found her Tuesday morning lying unconscious in the snow near Recreation Park. Police say they tracked footprints in the snow from where they found List to the 1100 block of Congress Street, where witnesses said they had heard the couple fighting earlier. Oyerinde is believed to have walked back to take the victim's mini-van, which is a 1997 Honda Odyssey. Detroit Police found Oyerinde later that evening in the same mini-van soon after receiving information about the search from Ypsilanti Police. He and the van were brought in to the Ypsilanti Police Department later that night. Oyerinde was arraigned yesterday for a misdemeanor domestic violence charge yesterday, where he requested a public defender. The domestic violence charge was related to another, earlier issued warrant, accusing him of assaulting List about a month ago. “She had a substantial wound to the head, what we later determined to be blunt force trauma caused by a crowbar, hammer or something with similar weight,” Police Chief Matthew Harshberger said after issuing a wanted poster for Oyerinde Tuesday. At the arraignment, Horne said List is currently hospitalized and in a medically induced coma. After hearing the bond recommendation, which Horne later approved, Oyerinde said he didn’t have enough money to pay any bond. “It really don’t matter,” he said. During the arraignment, the prosecuting attorney said the recommendation was based on the severity of the injuries List had received, and because he is considered a flight risk due to his arrest in Detroit nearly 18 hours after the incident is said to have taken place. A preliminary examination is set for Jan. 27 at 1 p.m.